Extravagant folly or sphinxlike masterpiece? Extravagant folly or sphinxlike masterpiece? Michael Heizer’s Levitated Mass has drawn both praise and censure since its June 2012 debut at LACMA. One thing’s for sure: The $10 million, 340-ton boulder perched above a trench is now a symbol of civic art, public spending, and complex engineering. Here’s how L.A.’s giant rock holds up. The 900 million-year-old granite chunk comes from a Riverside quarry frequented by Heizer. That it stood alone and unscarred after nearby blasting appealed to him — and at 21.5 feet high, so did its size. To move the boulder, a shipping company custom-built a 294-foot transporter with nearly 200 wheels. Though Riverside is normally an hour’s drive away, the transporter traveled 105 circuitous miles over 11 days—and at less than eight miles per hour through four counties—before ending up at LACMA. 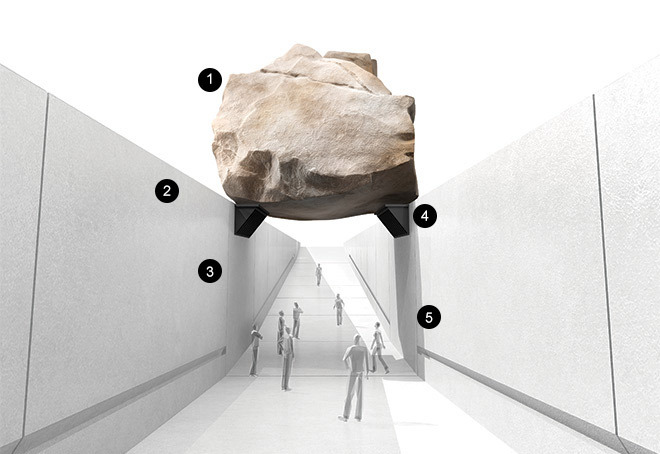 In April 2012, the rock met its counterpart: a 456-foot-long slot cut into the earth in the museum’s backyard. The concrete structure is the granite’s roost as well as a pathway for visitors. Built-in handrails ensure access for all. Heizer’s earliest conceptions of the rock-and-slot sculpture date to 1969. The green light came decades later, when the artist’s friend Michael Govan was appointed LACMA’s CEO and director in 2006. Local and state seismic codes required the boulder to have a stronger base than the original minimalist trench. The artist chipped away parts of the rock’s bottom so it would sit flush atop two stainless steel shelves bolted to the walls. With a core drill and special epoxy, engineers inserted steel pins through the shelves and into the rock, stabilizing the sculpture. Levitating or not, this mass ain’t going anywhere. The distance between the boulder and the ground is 15 feet. Channels built at the base of the walls whisk away rainwater into a nearby storm drain.